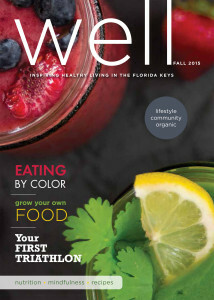 I’m honored to be featured in the first edition of the new Florida Keys health and wellness magazine, WELL. 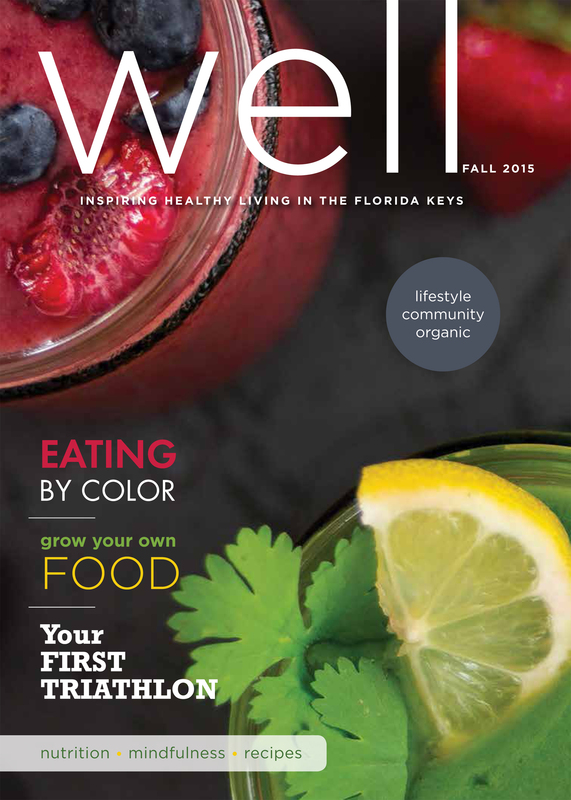 If you are out and about in Key West, please pick up a copy of this great new publication dedicated to the organic lifestyle. Featured are articles on healthy eating, wellness, gardening, meditation, mindfulness, food, alternative therapies and recipes. 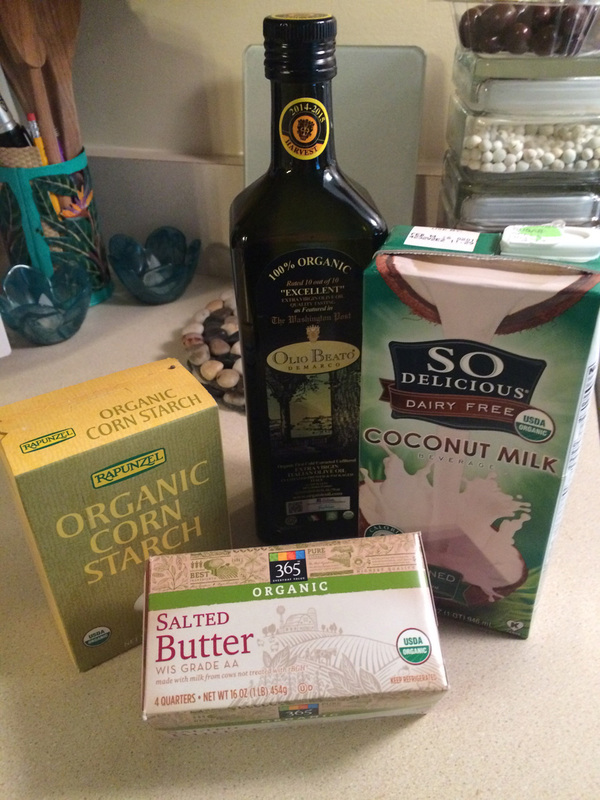 If you’ve been reading my blog for any amount of time, you know that we’re pretty much dairy-free EXCEPT for cheese. So this recipe is essentially dairy free until you add the cheese. This is a recipe that was born of my Mom’s potatoes augratin recipe, except I’ve eliminated glutens and most all dairy. And it’s what I call a ‘warm fuzzy’ dish. My husband loves this kind of thing. While this isn’t my usual uber-healthy style of dish, it’s more healthy using coconut milk and olive oil instead of cow’s milk and butter. The good thing about this is that this recipe does indeed give you some fiber. I’m a huge fan of fiber! Most people don’t get nearly enough every day. Women should have 21 grams a day and men should have at least 32 grams a day. Without fiber, your digestive system (and colon) simply don’t work properly. Fiber also helps offset any damaging sugars that you might take in, and along with protein, gives you the energy to stay active all day. 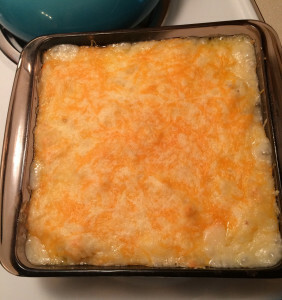 This recipe uses my own version of a bechamel sauce, detailed below. You can use any type of potato you have on hand, but be aware your results might vary depending on the potato you choose. 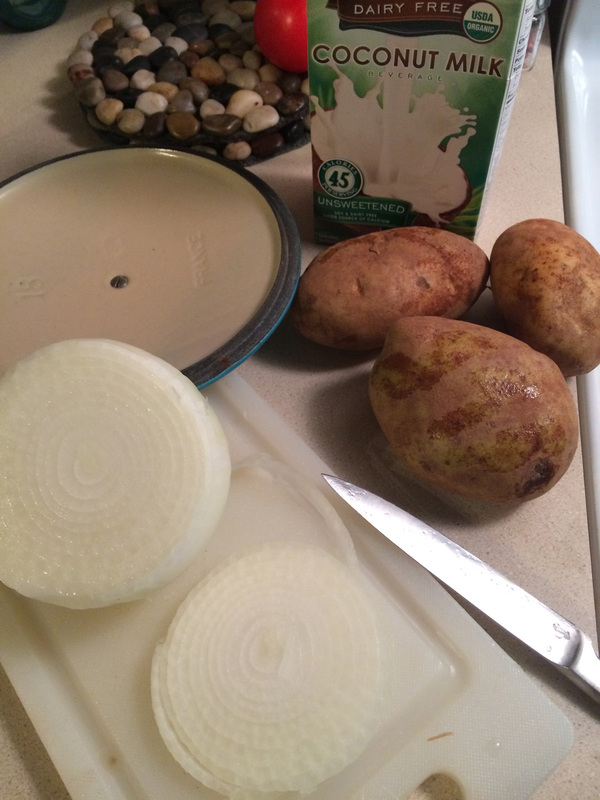 Today I used Russet potatoes simply because they were the only organic potatoes available here in the store today. They aren’t the most preferred for this type of recipe. Your potatoes will hold up better in the dish if you use red or white potatoes. Some of the ingredients and instructions are approximations. 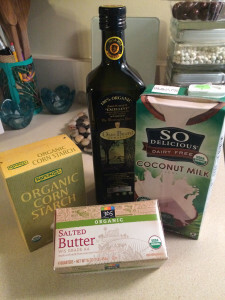 I go by how things are moving along and by how the sauce looks as I’m building it, so some of this will be up to you as to how much you use when it comes to oil (or butter), corn starch and the coconut milk. Also, I pealed my potatoes, but to be honest, they’d be far healthier if you leave the skin on after scrubbing, to give you yet even more fiber. PLUS for me, the less time with a knife in my hand, the better. I’m prone to cutting myself when cooking, and also to burning myself. Recently, I cut my hand, then when removing something from the oven, I burned the exact place where the cut was! No kidding! 5 cups grated organic sharp cheddar cheese. Place the sliced potatoes and sliced onions in a pan. Fill pan about 3/4 full of water. 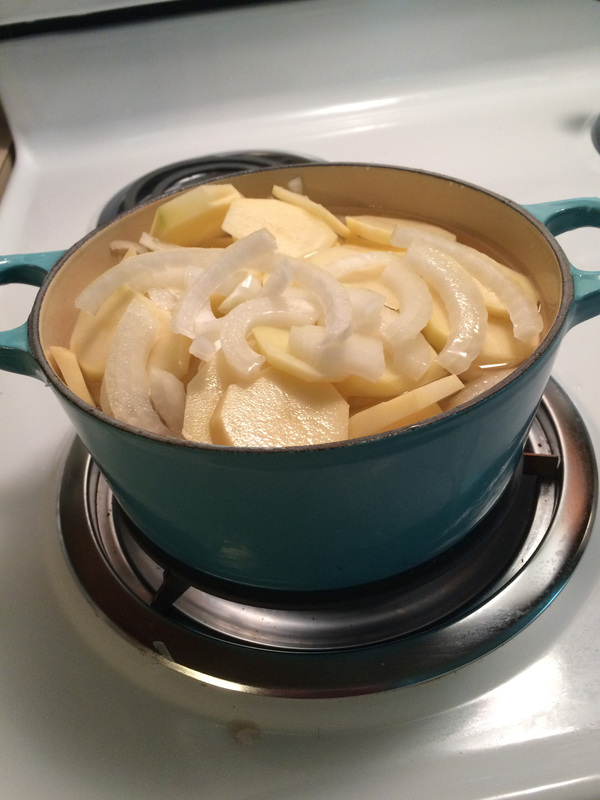 Cook on medium heat approx 20 minutes or until potatoes are tender and onions are transparent. Drain. 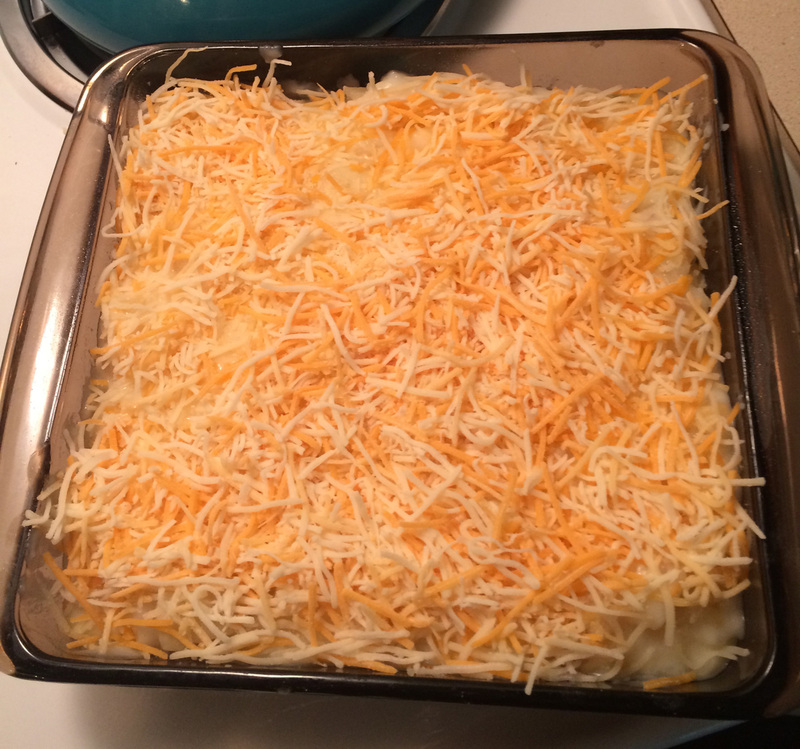 Place the potatoes and onions in an 8″ x 8″ baking dish. Add about 2 cups grated cheese and very gently stir into the hot potatoes to mix. For the bechamel sauce, start with approx 5 TBS olive oil (or butter if you choose) in a sauce pan. Allow to heat but not bubble. Gradually stir in the corn starch until you have a thick roux. Cook a minute or two until all is well incorporated. Add coconut milk slowly, 1/2 cup at a time, stirring constantly, allowing the milk to incorporate with the oil / butter and corn starch mix. Continue to add until you have a good sauce consistency. You may not need this much coconut milk or you might need more. I play it by ear. Add 1 cup grated cheese and stir into the sauce. Add salt and pepper to taste. When thickened, pour the sauce over the potatoes in the baking dish, and gently stir or ‘nudge’ it into the potatoes. Add the remaining cheese to the top. Bake at 350 degrees for 35 minutes or more. If you want it a bit dryer and more browned on top, you can certainly cook longer. 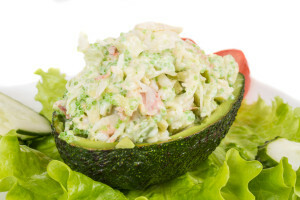 My quick and easy crab stuffed avocado will fool family and friends into thinking you’ve worked long and hard over lunch. Florida avocados are plentiful now, and they are delicious, healthy, high-fiber and will give you a really good dose of ‘good fats’. Mix onion, cilantro, lemon juice, mustard and Veganaise. Add crab meat and mix well. Cut avocado into quarters if it’s really large, peal and arrange on plate. If it’s a medium size avocado, half an avocado will serve one person. 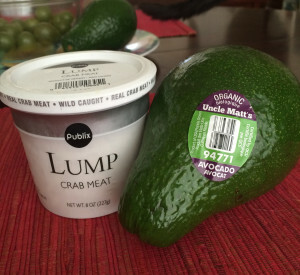 (Image above shows avocado half not pealed). Fill with Crab Salad and garnish. I buy the crab from Publix and find it to be rather good quality. You can also buy Snow Crab Legs and remove from the shell. This is a filling lunch or light dinner. I made this last week with a larger avocado than shown and it made a very healthy, filling six (6) servings. **WARNING** Do not make this or any dish from the ‘crab stick’ or other fake lobster or seafood products. What is it? It’s the sweepings from the floor at a fish processing facility! NASTY!!!! 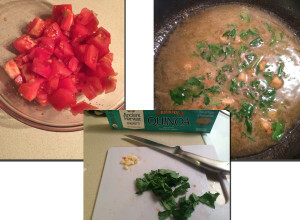 So many healthy, fresh meals are very, very simple to make. AND then the leftovers are simple as well. As an example, a few nights ago, we had Florida Lobster as our main course, with sides of fresh steamed green beans and sautéed fresh mushrooms. This is so simple, has a lovely, colorful presentation and very healthy as well. 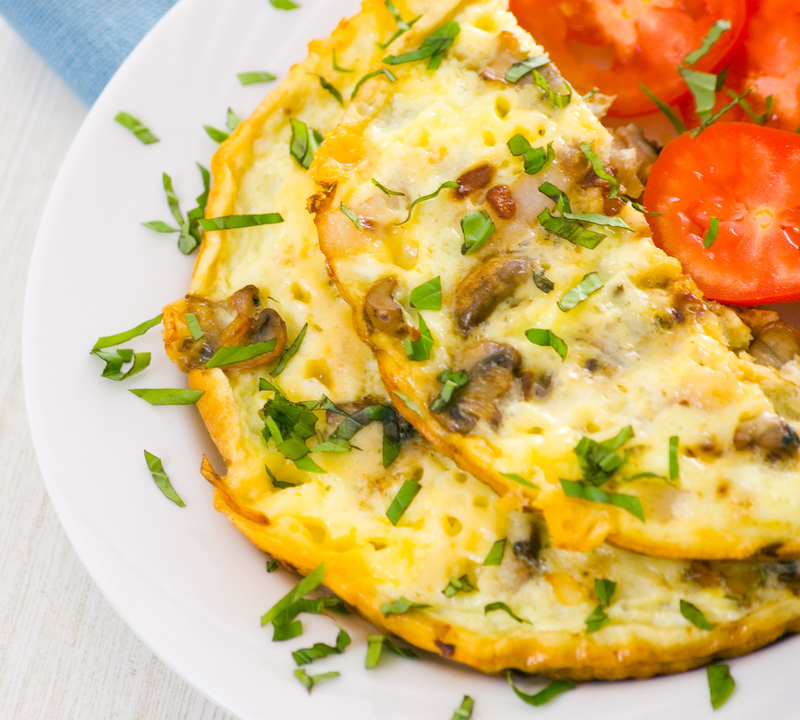 This is proof that healthy meals don’t have to be complicated. Then the next day there were lobster omelets for brunch. 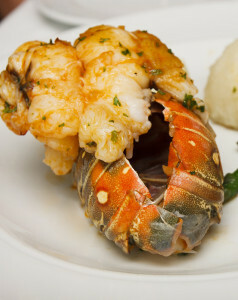 Slit the back shells of the lobster tails, and pull the meat out, leaving attached towards the ‘fin’ of the tail. Slightly butterfly the meat and arrange on top of the shell. For presentation, spread the tail and place on a baking sheet. Put small chunks of butter on each and put in preheated 350 degree oven for 30 minutes. At the end of 30 minutes, check to be sure that they are cooked through. Melt butter or ghee and put in small cups to be served with the lobster. 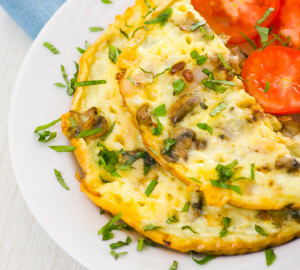 Arrange on serving plate with beans and mushrooms. Wrap remaining tail in plastic wrap and store in fridge. Slice mushrooms thinly. Melt butter in sauté pan over medium heat. Add onions and stir, until transparent. Add mushrooms and sauté until slightly browned, still over medium heat. Add herbs and allow to cook another 5 minutes or so. Chop lobster into 1/2″ chunks. Melt butter in large sauté pan. Add onions and mushrooms and cook until soft. Whip eggs with a TBS of water, and pour into pan over vegetables. Add shredded cheese. Once eggs are set, add the lobster and fold in half. Serve hot. I found a recipe recently that looked amazing. Of course, as usual, I changed it up a great deal. But I thought I’d share it with you. Season the tomatoes with the salt and toss them well. Put a big pot of water on to boil. Cut the basil into ribbons or roughly chop it. Heat a teaspoon or two of the olive oil in a large saute’ pan over medium high heat. Add garlic and cook til just beginning to brown around the edges and soften. This takes a couple of minutes. Pour the tomatoes into a colander over the saute’ pan so that the tomato juice will drain into the pan below. 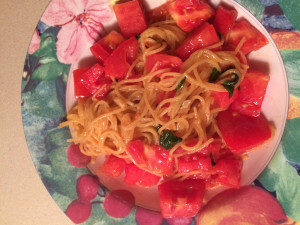 Set the tomatoes in colander aside, in a bowl. Swirl the sauce to bring it to a simmer. Add the butter while continuing to swirl or stir the sauce. Keep the sauce moving until all the butter is melted. Add the basil, the pasta and toss to coat the pasta evenly. Divide the pasta two bowls and top with the tomatoes. 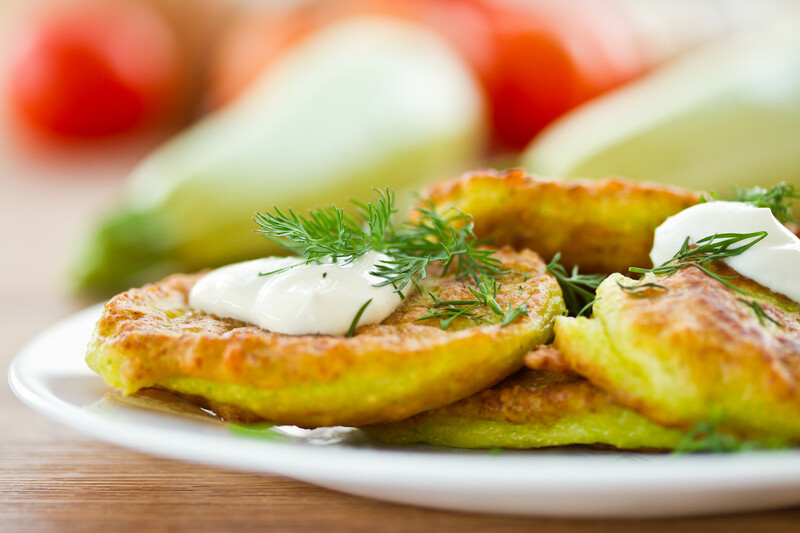 This recipe has a fresh taste that it impossible to beat! It is light, it is vegetarian and gives you fiber and nutrients as well. While I changed this up a bit, I do give credit where credit is due. The original version came from Food52.com in the Genius Recipes section.